The base 2011 model having only 2GB RAM was basically laughable, and the standard 64GB SSD got a whole lot more indefensible as time went on, but the experience was significantly improved by the switch to modern microarchitectures in the newer 11” Airs. But even so, the 13”, with its higher screen resolution, 16:10 aspect ratio, and larger battery, seemed to be the way to go, especially after the price dropped to $1199. For 2013, the entry level 11” and 13” SKUs have the same basic specs: 1.3GHz Haswell ULT processor, 4GB LPDDR3, and a 128GB SSD. The price difference has dropped to $100, with the 13” falling to $1099—making it feel like a way better deal, considering the extra battery life (12 hours versus 9 for the 11”) and larger, higher resolution display. And honestly, the 13” is not only a more usable primary computing solution, but also a better computer overall, so I’ll just get that part out of the way first. I will say though, it’s far easier to recommend an Air 11” now that the base model has the 4GB/128GB combo I’d consider the minimum for any ultraportable computer. It took a few years, but it finally became possible to recommend the base 11”er without any caveats. Where the 11” Air becomes really interesting though is when you stop thinking about it in terms of its larger sibling, but in terms of the iPad. Not only is the Air 11” dimensionally similar to the iPad, but now with Haswell it has roughly equal battery life too. And given that there’s just a $200 price difference between the 128GB iPad and the 128GB Air 11”—$100 if you factor in the cost of an iPad keyboard—it’s really something to think about. Sure, the iPad has a better display and is touch capable, but this is a real computer. It’s just as easy for me to carry the Air 11” as it is for me to carry the iPad, it even fits into the iPad pocket in my backpack. 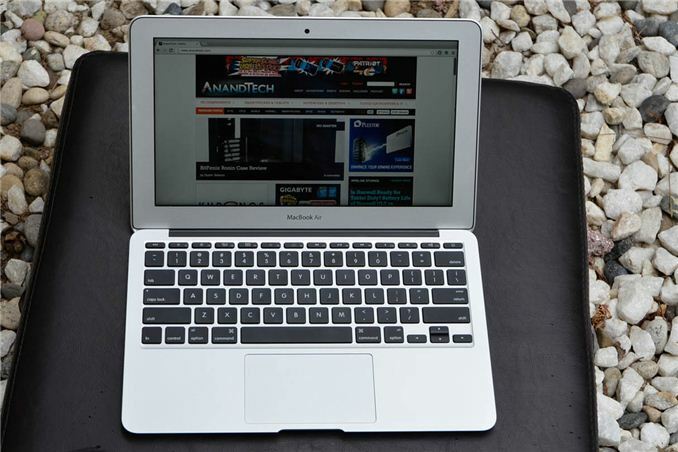 The images Anand took for the first 2010 Air review keep coming back to me—the size difference really isn’t that much. The current iPad is thinner and lighter than the first gen that we had back then, but not by much, and the footprint hasn’t changed at all. Other than the extra 2.3” in width and few hundred grams in weight (it’s just under a pound heavier), the two are pretty similar. 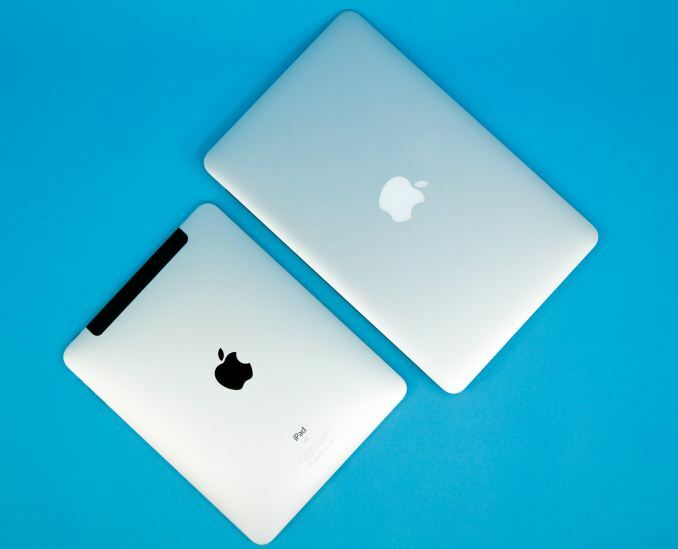 The depths are within a quarter inch of each other and the average thickness of the wedge-shaped Air is essentially the same as the constant thickness of the iPad. So this form factor with this battery life and these specs—does that make the 11” Air compelling enough to justify buying instead of the 13” or another PC notebook in this class? 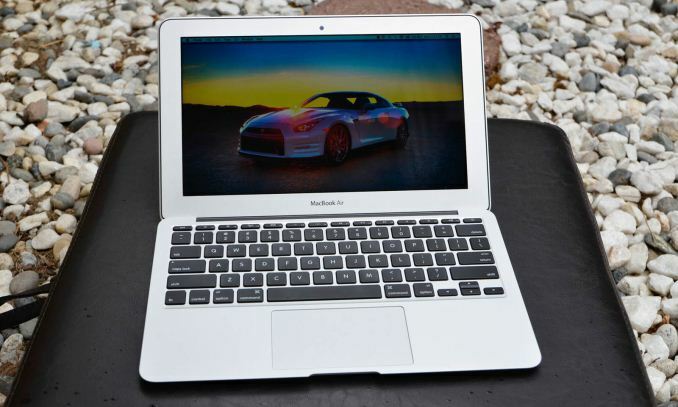 We’re really familiar with this generation of MacBook Air. This is now the fourth generation using this chassis (C2D, SNB, IVB, now Haswell) and in that time, not much has changed. The Air family added Thunderbolt and backlit keyboards in 2011 and moved to MagSafe 2, USB 3.0, and HD webcams last year, but other than that, this is externally essentially the same computer it was back in 2010. This year, the Air gets a second microphone hole in the left side. For reasons unknown, the listed weight for the Air 11” changed from 2.3lbs to 2.38lbs between 2010 and 2011, but has stayed constant at the latter in the generations since. The chassis is still phenomenally thin and very well put together, with a pleasing simplicity and extremely compact dimensions all around. The keyboard and trackpad are still the best on the market, and it’s awesome to note the uniformity of Apple’s keyboard from the 11” Air through the rest of their larger notebooks and the wireless keyboard that ships with the iMac. I don’t understand how nobody else has figured out how to make a buttonless trackpad as good as Apple’s at any point over the last five years. Over the last few years, I’ve been tempted to buy a Mac more than a few times just because of how good the input devices are. It’s legitimately an advantage that Apple holds for their entire notebook lineup, one that is very critical in a smaller notebook like this one. There’s not much in the way of port selection, but that’s actually not too big of a deal. Perhaps after years of living with ultramobile systems, I’ve learned to make do with just two USB ports and a video out, but it’s honestly good enough for this class of notebook. There’s a lot new on the inside though. In addition to Haswell ULT, Apple has pushed the envelope and gone for PCIe SSDs and 802.11ac. Considering the other innovations Apple has brought to the mobile computing space over the years, it’s probably not that surprising that they were the first to get ac and PCIe storage into Ultrabooks. Sony has since also started shipping a set of similar systems with PCIe SSDs in their VAIO Pro Ultrabook line, and I’d be very surprised if many of the other high-end Ultrabooks set to launch later in the year don’t have at least one of those two things. Anand has covered the different Haswell ULT parts used in the Airs pretty in-depth so I’m not going to go into too much detail here. The base model Air 11” that we’re looking at today has the i5-4250U, a 1.3GHz part with max turbos of 2.6/2.3GHz (1C/2C) and Intel’s HD 5000 onboard graphics with a max GPU clock of 1GHz. The i7-4650U is a $150 option and bumps base clock to 1.7GHz, turbo to 3.3/2.9GHz (1C/2C), and GPU max to 1.1GHz. I typically don’t go in for Apple’s upgrade pricing, but this is actually pretty reasonable given the performance increases involved. I think I’d be more tempted to go for the upgraded CPU in a 13”, simply because I’d want to eke every drop of battery I could get from the smaller notebook. The battery has been upsized, now to 38Wh from the previous 35. It’s still a fair ways behind the 13” in terms of battery capacity though; the 54Wh battery in the larger unit represents a 42% increase in size that more than offsets the display-related power consumption delta. And you say the same thing about cars? People who buy a Tesla or Lexus or Mercedes are idiots because, heck, I can buy a Versa or a Kia for way less? Hell, why are people so stupid as to want to live in their own houses --- all you need is one third of a room you share with two other guys, in an apartment fitting eight people. Don't feel too sorry for them; if they're buying apple they probably have cash to spare. To make a point other have -- Apple products are, as a general rule, very well made. The MBP I bought in 2006 for $1800 is still chugging along just fine 7+ years later. In that same time, a friend of mine had gone through 2 HP laptops. He recently bought himself a Retina MBP, even though he detests OSX and installed Windows 7.
okay well I've been looking up laptops and this pretty much has the best battery life etc. for a portable laptop i can find. hp and acer are apparently more unreliable and have really high malfunction rates, and then the asus is not that portable and quite expensive anyway? I'm waiting for Retina (and getting rid of that archaic looking aluminium ring around the display), as well. I hope it arrives next year. I wasn't hopefully that the power saving of Haswell and the 5xxx iGPU would be enough to make it a reasonable inclusion this year.